I have the sweetest Easter book to share with y'all today! 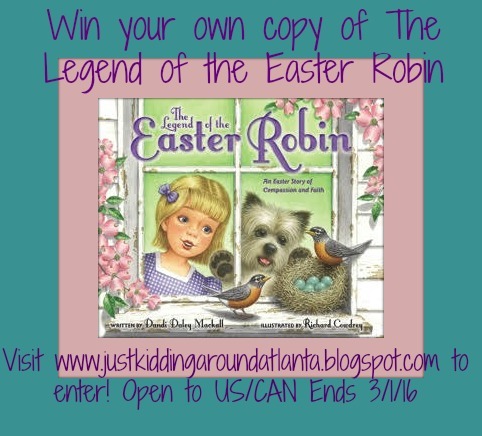 It is perfect for reading with your little ones, and I think it will make a precious new Easter tradition. Filled with lovely full color illustrations, I hope you will love it as much as I do. Check out the official book trailer here! I have a copy of this beautiful children's book to give away to one of you! There are several easy entries in my rafflecopter widget to make it easy and fast for you to enter. Good luck! (Make sure to complete the mandatory entry - otherwise none of your other entries will count, and I'll have to pick another winner!) PS: The date in the image at the top of this post is incorrect, contest actually ends 3/3/16! Open to US & Canadian residents only. Only one entrant per mailing address, per giveaway. If you have won a prize from our sponsor Propeller / FlyBy Promotions in the last 30 days, you are not eligible to win. Or if you have won the same prize on another blog, you are not eligible to win it again. Winner is subject to eligibility verification. We enjoy an Easter brunch, then do an Easter egg hunt in the backyard.